Canals were an important part of commerce in Europe for centuries. Barges would ply their calm waters transporting their goods from one town to another. They were an important part of the trade route through Europe. Canal in Flanders Mill tapestry captures one of these trade routes in its pristine beauty. A tall stand of trees is mirrored in the canal in amazing detail. The water is rippling ever so slightly in a breeze. In the distance, a windmill spins in silence, milling flour for the nearby village. Inspired by history, “Canal in Flanders Mill” is reproduced in typical Flemish landscape style. 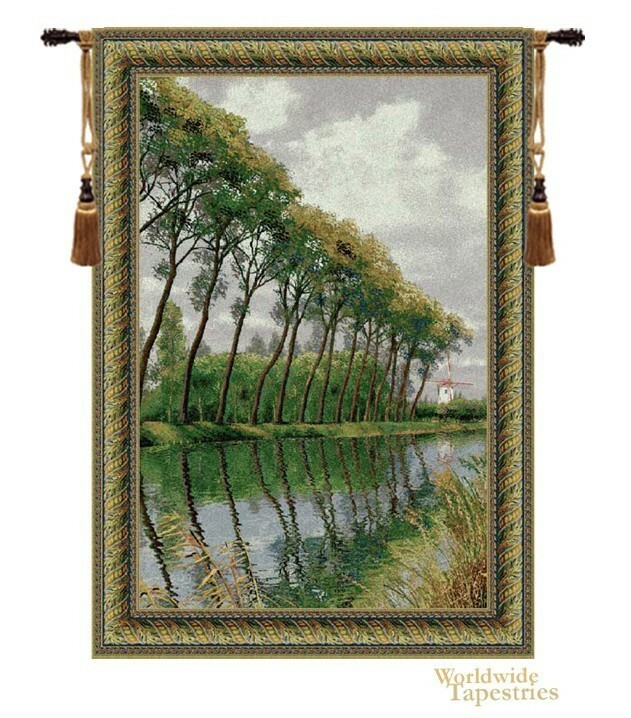 "Canal in Flanders Mill" tapestry is lined and has a tunnel for easy hanging. Note: tapestry rods and tassels, where pictured, are not included in the price. Dimensions: W 31" x H 41"
Dimensions: W 46" x H 66"